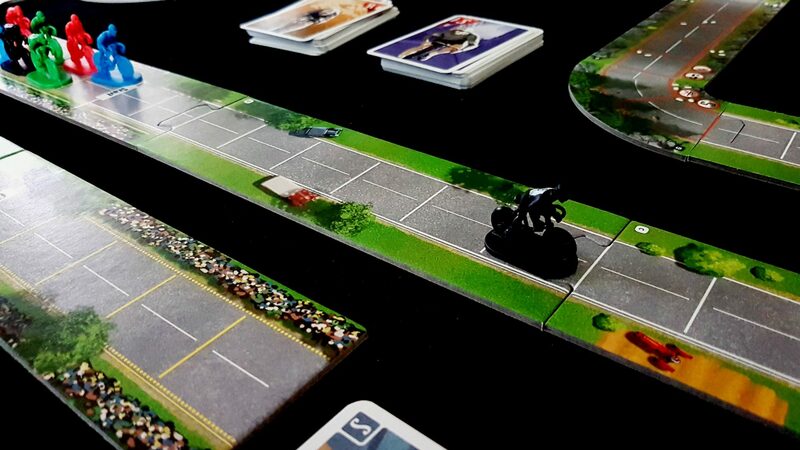 If you ever wanted a game that combined the design ethos of Candyland with all the excitement of queueing while sitting atop a bicycle, then today is your lucky day. 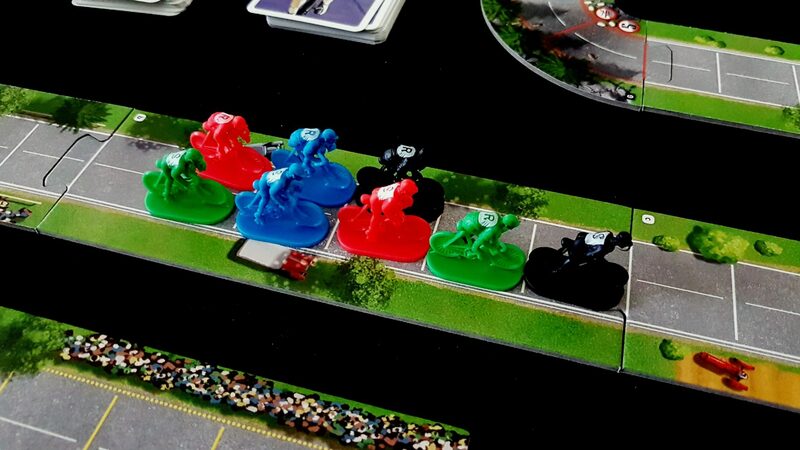 We’re talking about Flamme Rouge. Hoo boy, it’s better than that too because you also get to mix the unbearable smugness of your average cyclist together with the legendary mercurial surliness of the French. This box contains a mix of ingredients so potentially toxic that you really need to be wearing hazmat material as you open it. Even the cover oozes a certain kind of leering Continental arrogance straight out of a pro-Brexit voting pamphlet. Ah, don’t mind me – I’m only playing with you. I love the French – when I was in Paris a few years ago they were spectacularly lovely in a way that genuinely knocked me sideways. It might have been the lingering cultural reverberations of the Auld Alliance, but the Scots and the French have historically gotten on pretty well and my own experience bears that out. 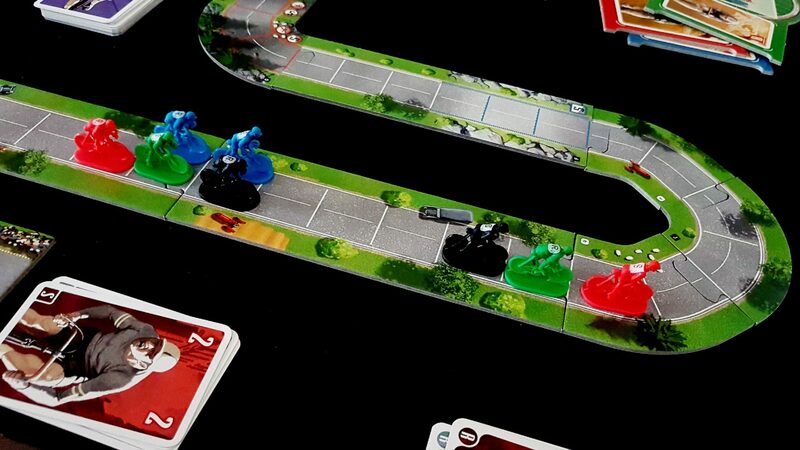 And while the card based movement of Flamme Rouge does have echoes of Candyland, it’s a tight evolution of a formula that retains the intuitive gameplay whilst giving it real tactical and strategic heft. The Tour De France may well be an exercise in watching people queue at speed, but it’s also a celebration of athleticism that is genuinely inspiring. And as for cyclists, well… I also mentioned them above! Flamme Rouge, or ‘Fiery Roads’ as it is properly known in English, is a game of two strong and powerful cyclists propelling their bicycles around a racing circuit with the intention of proving that they, not the others, are the best at quickly moving their feet up and down in a cycling motion. 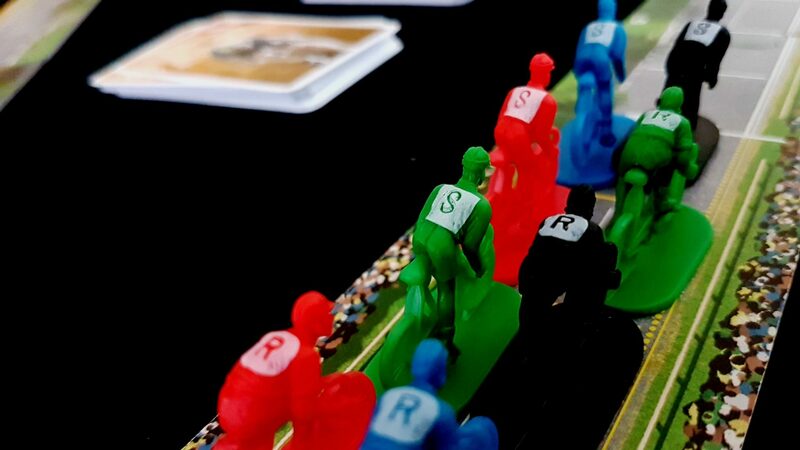 Each player controls not a single cyclist, but a pair of cyclists – a sprinteur, which is French for ‘speedy man’ and a rouler, which roughly translates as ‘other man’. And yes, they’re men – bicycles are no place for ladies in this curiously anachronistic take on competitive velocipedia. One of your cyclists is a pacer, acting as support. The other is a sprinter, looking to stay fresh to cover the final distance. They fight crime! 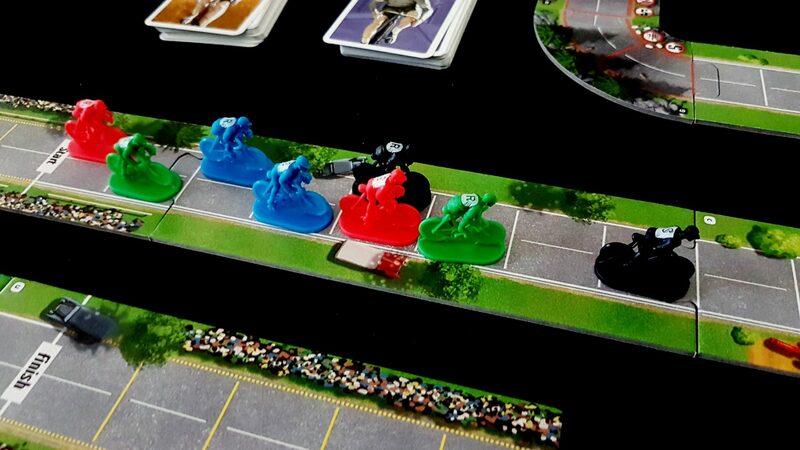 Or rather, they fight each other and the mass of cyclists arrayed behind them because Flamme Rouge is a really a game that is about being a kind of velocity parasite. Clever play involves taking advantage of the hard and exhausting work of the other more honourable cyclists in whose company you are travelling. The rules are simple – you start at the start, you end at the end. The player that controls the team that most effectively passes the finish line wins a lifetime of talcum powder for their bitterly chafed thighs and fetlocks. The courses are constructed from jigsaw style pieces that snap together in various ways according to set diagrams in the box. They can also be fitted together largely at random to fit a particular table layout. That’s what I did for the course you’ll see in this post. I call it ‘The Commuter’s Crucible’. It’s like wandering around Edinburgh – even going downhill is an uphill struggle. How does your brace of cyclists manage to race this torturous track? How do they move forward very fast whilst staying approximately upright? Well, with cards of course! One use, disposable cards that determine how many spaces forward a cyclist can move on his turn. You have a deck of cards for your speedy man, another for your other man, and before you can play a second card for one you have to play the first card for the other. You draw four from your deck, pick a card, and then slap it face down. You then draw four cards from the other deck and go ‘Oh, bugger’ as you realise just how badly things have gone for you between playing a card and drawing a hand. Each of the cards you play is used precisely once, and then it’s discarded – you never see it re-enter your hand. The ones you don’t play will circle back in though, as will a pile of ‘exhaustion’ cards that you accumulate as you go around the track. Your useful options only ever get whittled away and so it’s incredibly important to pace yourself. What’s more important though is to make sure that you’re in the right place at the right time to benefit from the hard work of everyone else. Let’s look at how it all works – for our speedy man we have a hand that contains a two, a three, a five and a nine. We’re going to play down that nine. After all, why on earth wouldn’t we? If the aim of the game is to be fast going around a track, then bigger numbers are faster than smaller numbers. That’s why when kids are playing hide and seek, ‘eight nine ten’ is counted much faster than one, two, or three. That’s basic arithmetic you should have learned at school. Nine is fast, two is slow, and so we play nine because we want to go fast. Once everyone has played the cards for both their riders, the moves are revealed and executed in position order. Our speedy man is currently in first place because he’s at the right most edge of the track, and closest to the finish line. As such, he’s the first to move. Woosh, and with that the race is as good as won, right? I mean, that’s a hell of a lead and all you need to do is make sure you don’t lose it. Everyone else reveals their cards in order but you know what the weird thing is? Nobody is going all that fast. Maybe they didn’t draw the cards to cycle quickly, but maybe, just maybe, you’ve made a huge mistake. The thing about cyclists is that they’re lazy – being first in a track means that you’re the one cutting through all the air resistance with nothing but your own two little legs. Being a bit behind someone means that you get the benefit of their hard work while expending comparatively little energy of your own. If you’re a cyclist with nobody in front of you at the end of the round, you acquire an exhaustion card that cruds up your hand like serotonin in your muscular system. As the race goes on, more and more of these will cycle into your hand making it more and more difficult to draw the cards you need when you need them. It’s nice to be the leader of the pack, but it’s also very tiring. Why does everyone else look so tired? Still, at least almost everyone else will be suffering the same thing, right? Wrong! Dead wrong! In real life, cyclists that are in the middle of a pack might save as much as forty percent of their energy when they benefit from air pressure distortions. It’s genuinely that much easier to cycle through the turbulent wake left by someone else’s passing. So easy in fact that racing strategies are largely built upon this – it’s called drafting, and permits the rear rider to use favourable eddies in the air current to catch up on a lead rider with a more conservative expenditure of energy. In an ideal circumstance, a cycling race is one rider working to benefit the rear rider on their team ensuring they’re fresh for when they need to slingshot out and across the finish line. 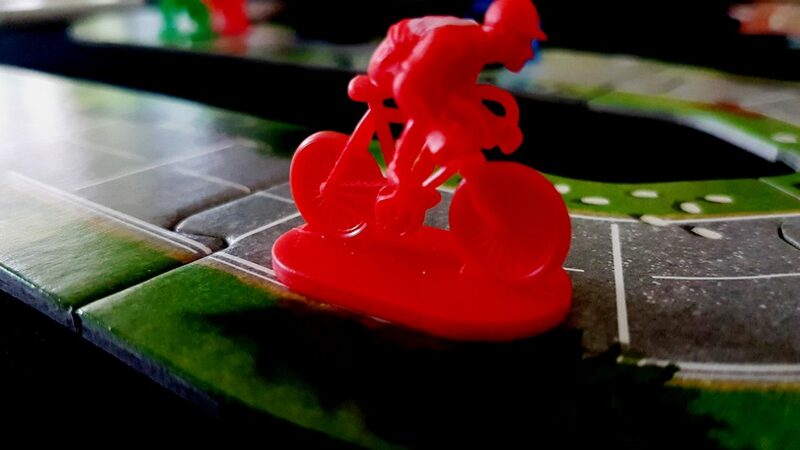 Unfortunately, Flamme Rouge doesn’t present you with an ideal circumstance. Instead, you’ve got all the other cyclists in the race desperately trying to feed off your efforts like lazy schoolchildren cheating off the smart kid. 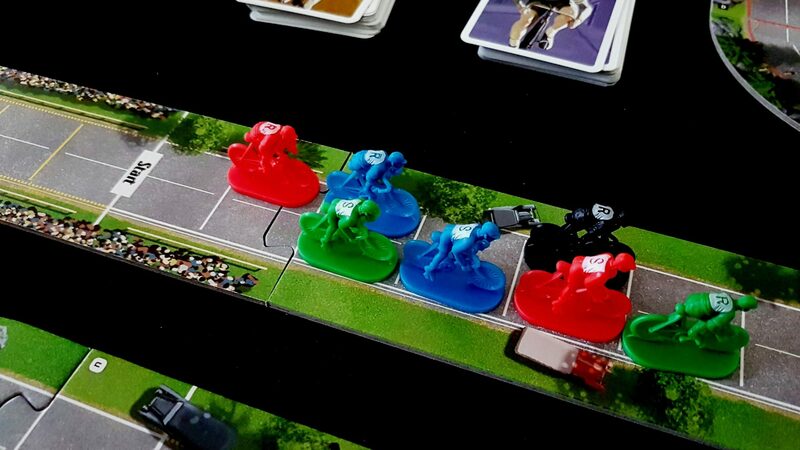 Within Flamme Rouge, this is modelled with a pack system – every grouping of bikes where there is a space between them and the next pack gets a free point of movement that brings them just behind the front-runner. That’s awesome, but packs get evaluated from the farthest one onwards – the last rider in a long line of packs might benefit from several slipstream actions as the round is evaluated. As such even playing a relatively low value card might yield significant returns if you can benefit from multiple slipstream events – it keeps you fresh while you steal effort from everyone else around you. You’ll need to be the one that most effectively crosses the finish line, but until that happens all you need to do is ensure you’re in the right place in the pack each and every round. The thing is that’s what everyone is trying to do, and those that are doing the heavy lifting in the race tend to get a little resentful of it. And resentful people, with muscles full of toxins, might begin to question why it should be their job to keep everyone else fresh. And so, a resentful speedy man might decide to pull ahead even farther. Or, they might decide to drop back in the hope someone else overtakes and they get a breather for a bit. It’s the exhaustion and slipstream that elevates what is an extremely simple mechanic of movement into an effective gameplay system. This is a game that is part about going fast and part about positioning yourself to profit off the efforts of others. 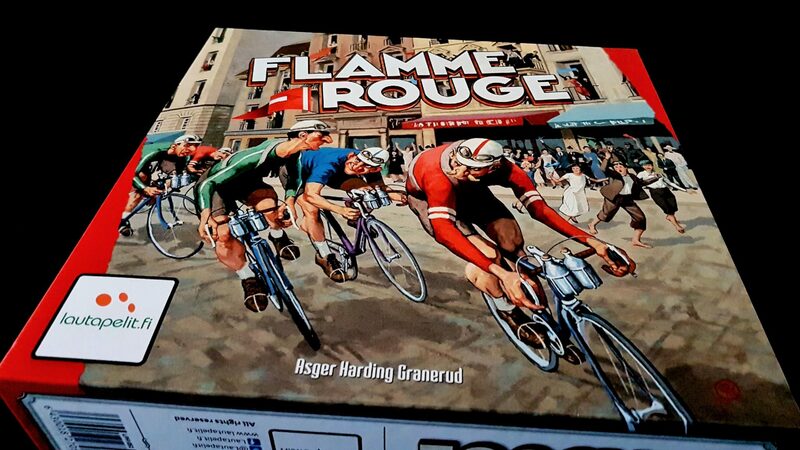 Flamme Rouge is approximately equal percentages probabilistic evaluation and poker match. Not so smug now, are you? That by itself is enough to sustain the game, but into this we also throw hills – hills which make at least certain parts of the track more knowable. On flat ground, someone can play a card and you have no idea what speed they’re planning to move. With hills you get more of a chance to meaningfully divine intention. 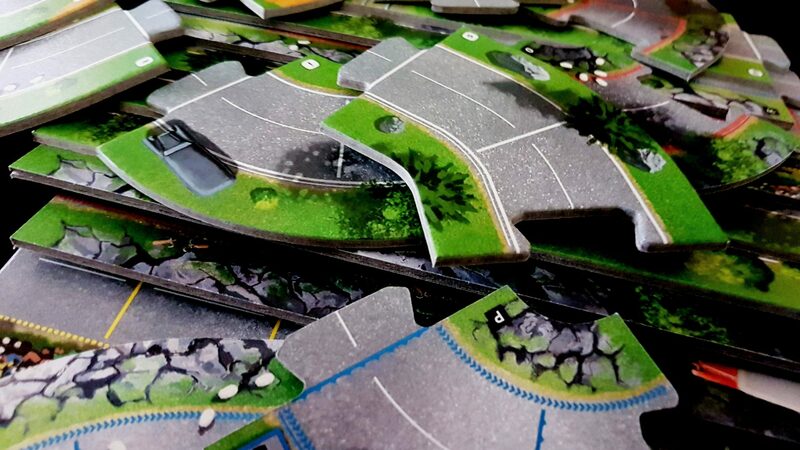 If your movement happens to hit an uphill phase, it’s like suddenly having your wheels stick in mud – no card you play can move you more than five spaces. 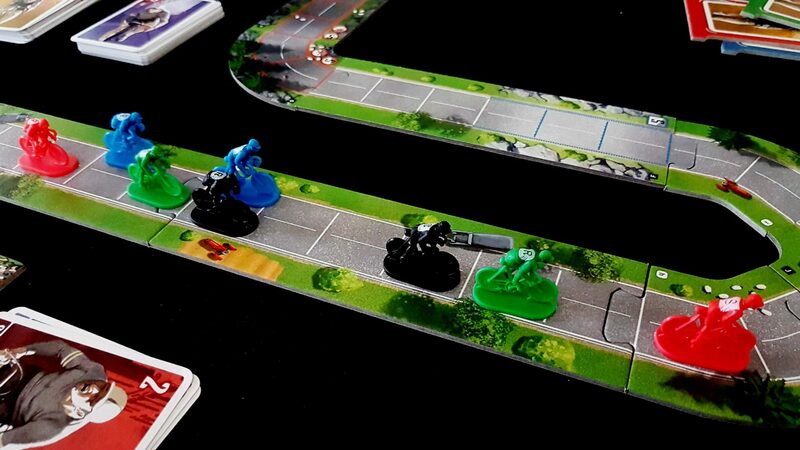 If you’re going downhill, it’s the opposite – no card you play can move you fewer than five spaces. Downhill sections are a great way to get rid of exhaustion, but there’s no point saving your high moving cards if all that’s ahead of is a massive uphill battle. Uphill sections too prohibit anyone from giving or receiving a slipstream boost, and so no matter how tired your cyclists are they just need to pump their little cannon- bones and feel the burn. Where the long, flat sections of the road permit meaningful jostling of position, the hills tend to funnel movement along a predictable, or semi-predictable path. They add knowability to the puzzle even as they remove many of the incentives for predicting player actions. They create a possibility space that expands and contracts like the digestive system of a boa constrictor. 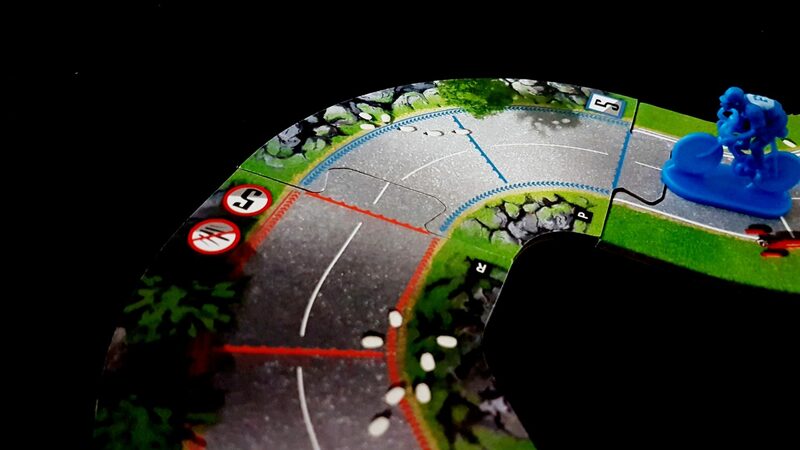 Not only that, but their presence in the near future of the track gives players opportunities to guess at the intention of their opponents – the benefits of an downhill are gained only when you start in a downhill region and so everyone will want to stop in there if they can. The result of all of this is to turn a game that could have been abysmal into a game that is actually lots of fun. It’s not really about the cards in the end. It’s all about the people that will be playing those cards. Nobody can with this just by playing their highest cards every round, and their best card will depend on what everyone else thinks that they think their best card is. And yet, while this is a game where clever play will be rewarded it’s not a game where clever play is enough – good players will be able to guess at what cards you have available in your deck but they won’t know what’s in your hand. They certainly won’t know how the hand of the speedy man is going to influence the way you play the hand of the other man. Even you can’t rely on a synergy of cards between the two and you’re the one playing them down. The result is not so much a keenly observed abstraction of professional racing, but rather the Tour de France as imagined as a comedy farce. People end up behind despite cycling the hardest, and the slowest and least effortful of the pack can end up yielding the most benefit from the efforts of others. It’s exactly the kind of race about which I could imagine a hard-line Tory voter writing an angry letter to their local paper. It’s a representation of benefit scrounging to which any pro-Austerity politician would nod along in self-satisfied validation. Is the Milan-San Reno as communicated through the gibbering rantings of an unrepentant Thatcherite. But what makes this especially nice is that the game momentum repeatedly shifts over the course of play. The middle parts are different from the starting parts, and the starting parts are dramatically different from how it all ends. The shape and makeup of the track is going to define how the rest of it goes and it gives every race its own peculiar personality. In the our last game I had, completely randomly, put together a course that was brutally punishing – so many hills that led upwards, and comparatively few leading downwards. As such, for large parts of the track our high cards were virtually useless. Even when we did hit a luxurious section of downhill track it normally terminated directly in an uphill incline that curbed its benefit. The early parts of the track were the only places where going fast made any real sense. And yet, not quite because the final part of the track terminated in the lip of a hill that lead to a flat race to the finish line – and while at that point our cyclists were largely limping by on exhaustion all it would take would be one good card at that part of the track to propel into the win. The different tracks wind their way up and down, left and right. In the process they set the scene for very different kinds of long-term strategy. The story of the race changes along with the track but the end is almost always genuinely a little bit thrilling. It’s like doing an obnoxious slow-roll in poker except even you have no idea if you’re likely to be happy at the end of it. You come out of a freewheel slalom or peek your head over the precipice of a massive, gruelling uphill battle. And then the track opens up for the three or four of you that made it and suddenly it’s all to play for. For all of that good stuff though there are some problems that come along with these mechanics. For one thing, it’s important to be behind but not too far behind. If you fall out of sync with the other cyclists, you’ll find it incredibly difficult to catch up. There is a razor wire of contention here because catching up requires slipstreams and canny pack manipulation, but that in turn requires you to be within sniffing distance of a pack. If you’re not, all that happens is that you gradually become less and less able to catch up as you continually accumulate exhaustion. Eventually all you see when looking at your hand is a great sea of red. And to counter that, the player that is doing best is usually doing better than anyone can realistically factor into decision making. There isn’t a runaway leader problem here, but rather a runaway runner up – the player that is in second position for the majority of the race is the one most likely to be fresh at the end and in a position to take advantage of it. Mastering the systems of exhaustion and slipstreaming yields ever greater benefits that can be kept secret from the entire table unless everyone is very sharply observing what’s going on. It’s a system that very much rewards player skill, but in a somewhat insidious way that lacks obvious transparency for everyone at the table. As might be expected though, the largest problem is that while you get lots of real opportunities to make real decisions, you often don’t have the tools needed to take advantage of them. Having a nine left in your deck for the final sprint to the end doesn’t mean much when all you draw are exhaustion cards. You’re often left at key parts of the game fumbling urgently around in your toolbox for the hammer you packed specifically for that circumstance. When all you come up with are useless spanners, it’s hard not to feel aggrieved. 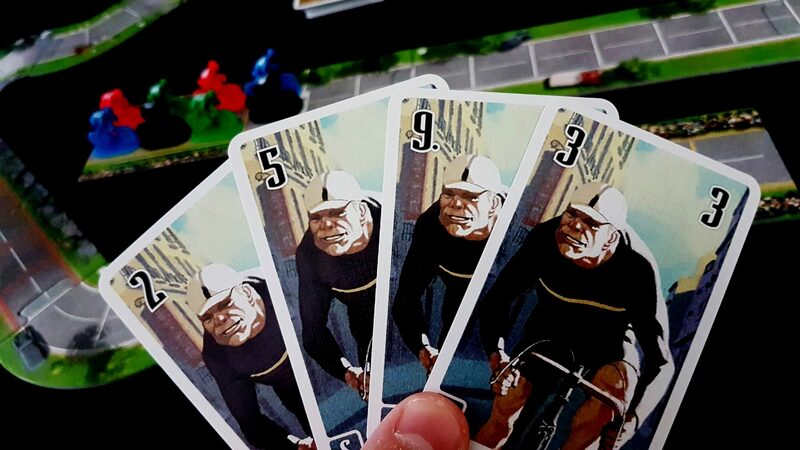 No matter how good your planning and play might be, success is still highly dependent on the cards you have curated to cycle (teehee) into your hand at exactly the right time. Don’t let any of this put you off too much – there’s a significant extent to which these problems, all of them, are actually a function of the game working exactly as intended. When you fall out of contention, nobody is to blame but yourself and you’ve always got two cyclists in the race so you need to be doing pretty poorly for both of them to be useless. If you don’t notice someone quietly accumulating future advantage then maybe you should have been paying closer attention to what they were doing than you did. If your deck won’t behave itself, then you had a role in that – overall deck composition is as important to success as any individual card you play. However, all of this is a little at odds with a game that is otherwise so instantly approachable and intuitive and I can see how that might mar the shine of play a little for many players. More fundamentally, it’s also a game where the lavish components simultaneously create problems and add value. Setting up any individual track is quite tiresome – that’s why I do them randomly. The layout of these is surprisingly prissy – the way the reversible track segments work is that if you flip them over their orientation changes, so you need to find the right piece and place it in the right way at the right segment or everything changes as a result. 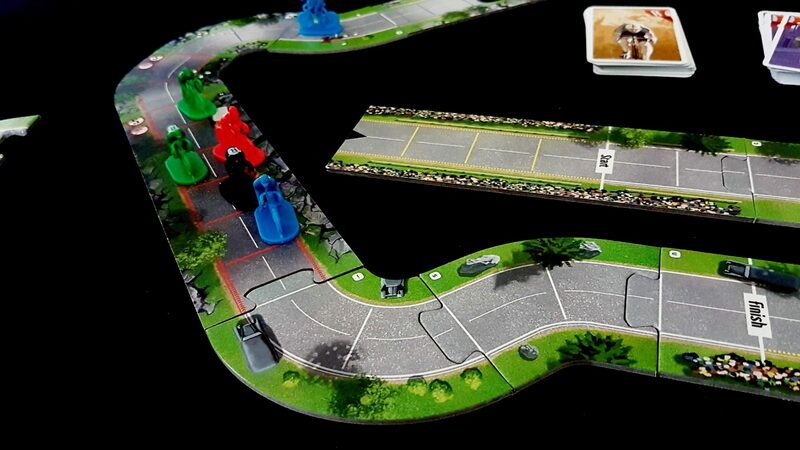 These mistakes may not alter the game itself much, but they can dramatically change the table space needed to accommodate a track. However, much like when I played with Scaletrix as a kid. track construction has its own indefinable joy. But enough of that. For now. Both of these component issues will come up more in the teardown. 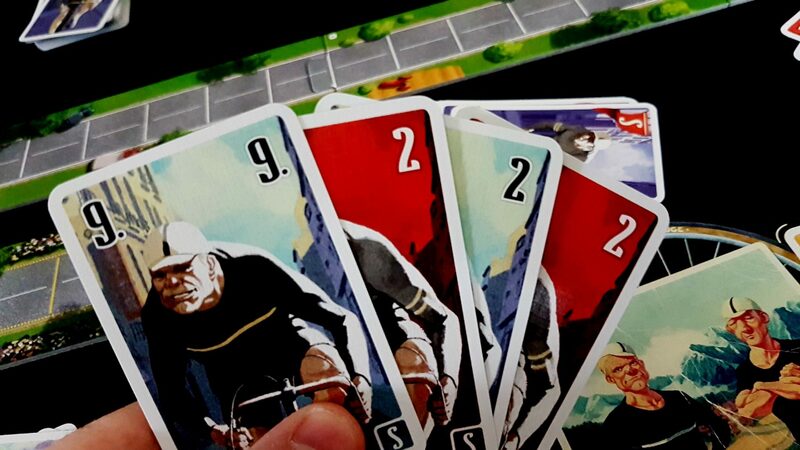 Flamme Rouge is overall a lovely and very enjoyable game – it’s a real treat in a box. The instructions are pleasingly slim and play is largely effortless whilst still being deep and absorbing. 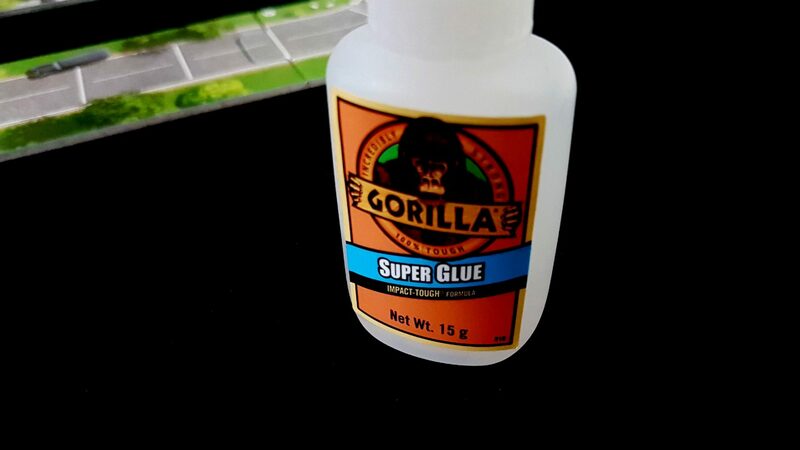 Give it a try if you see it around – I’m sure you won’t be disappointed.